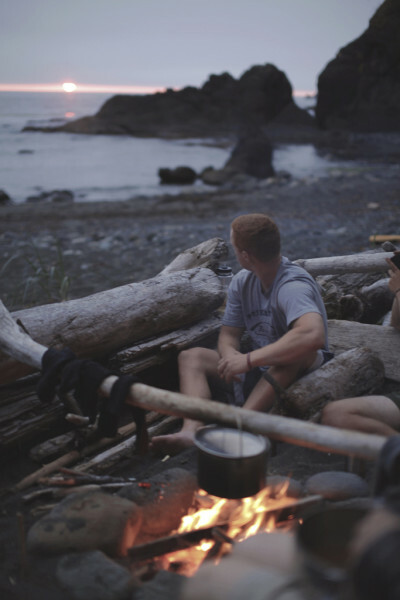 There are ample benefits associated with homemade dehydrated backpacking meals. First, they’re lightweight and easy to carry. Second, they’re free from artificial colors and preservatives and contain less salt compared with ready-to-use meals found in grocery stores. And finally, when you make dehydrated backpacking meals at home, they tastes like home. People who have never worked with dehydrated food before are skeptical or afraid to do it themselves when, in reality, it’s a simple process that is inexpensive and can be done at home. Follow this step-by-step recipe to create quick, delicious and nutritious meal on your next trip. 1. COOK the pasta in salted boiling water according to package instructions. Rinse the pasta with cold water to stop cooking process; drain and set aside. 2. HEAT the olive oil in a saucepan. Add onions, carrots and celery stalk. Cook until softened. Add the minced beef and cook, stirring, until fully brown. Transfer to a colander; drain. 3. RETURN the meat to the saucepan. Add the diced tomatoes, vegetable stock, salt, sugar and seasoning and stir to mix. Bring to a boil; then reduce heat to low. Put a lid on and leave to cook for 20 minutes, until sauce is well reduced. Remove from the heat and cool thoroughly. 4. 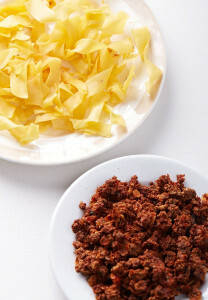 SPREAD pasta and sauce on separate dehydrator trays. Dehydrate at 57C/134F for 2-4 hours until pasta is dried; then turn heat up to 63C/145F and dry sauce for another 6-8 hours until hard and brittle. 5. 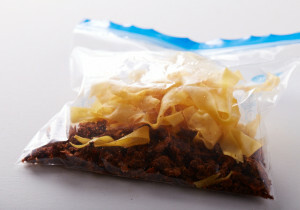 PUT dried meal into a zip-lock bag. Pack parmesan cheese separately. 1. 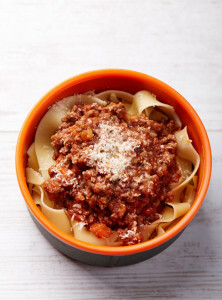 POUR pasta bolognese mixture into the pot; add 1 cup water and stir well. Place pot over medium heat, and bring to a boil. 2. COOK, stirring occasionally, for about 5 minutes. 3. REMOVE from heat, cover and let stand another 5 minutes to rehydrate meal completely. 4. SERVE sprinkled with grated Parmesan cheese. 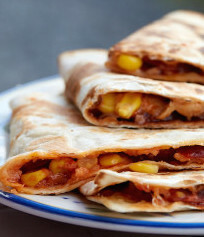 Want to see more recipes from Tanya? 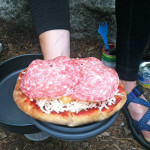 Check out Customize Your Backpacking Breakfast and Winter Hiking Foods. 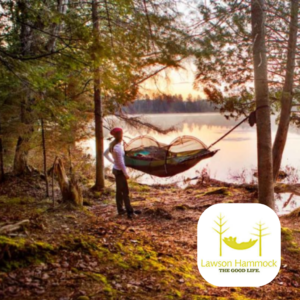 Passionate in two things, namely hiking and cooking, owner and founder of www.trail.recipes , Tanya Krezevska created the website to share with the world, easy steps she has uncovered to cook simple but still tasty recipes in her own adventures on different trails. Tanya earned her cook certification from professional school and has a diploma in culinary arts.